Beautiful handmade Venetian Glass Chandelier with 5 lamps. 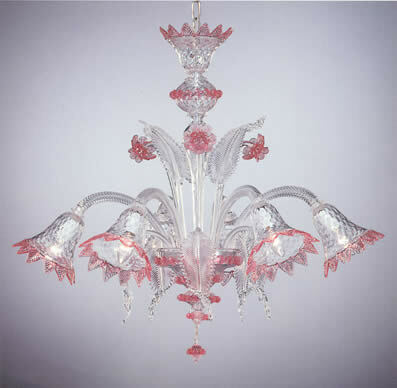 Handmade in the furnaces of Murano in classic 18th century style. Globes are diamond patterned with lacy pink edges. Pink flowers and crystal leaves grace the upper part and leaves flow over the base. 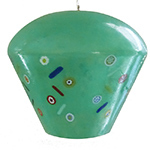 This Murano glass Chandelier is 36 inches across and can be adjusted from a minimum height of 22 to a maximum of 34 inches. Comes disassembled with instructions for assembly. Recommended for installation by electrician. Free ground shipping inside US from our warehouse in California.